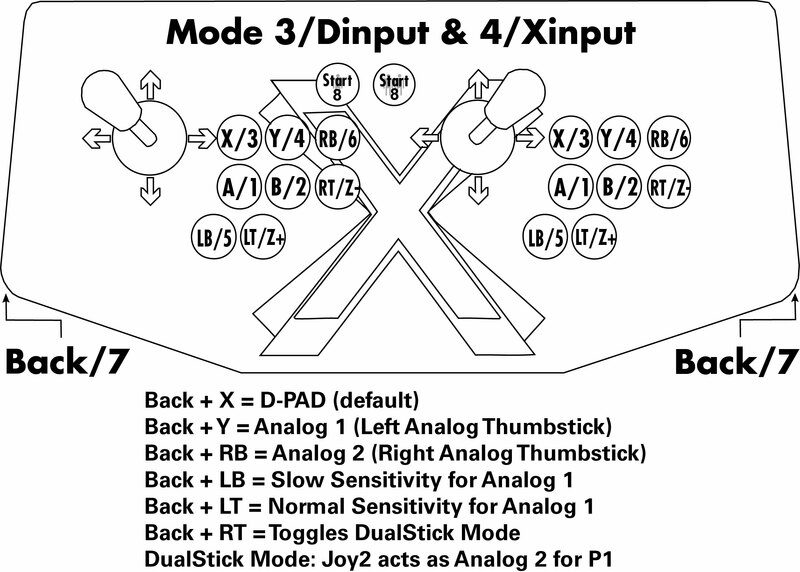 The original X-Arcade Joystick electronics PCB was designed as a keyboard, but new game controller modes (Xinput and DirectInput) have become popular since then. Now with the flip of the mode switch you can switch your X-Arcade between Keyboard Mode, DirectInput Mode, or Xinput Mode. You can then play with your X-Arcade as (2) Xinput Game Controllers or (2) DirectInput Game Controllers to support many devices such as the Nvidia Shield, Android-based consoles and TV boxes, Steam Link, Kodi, Raspberry PI, dedicated emulation consoles and more. Below we give our recommendation for what to use each mode for, but some modes can be used for multiple devices. Keyboard Programmable (Mode 2): You can map any keyboard keys you want to any button or joystick direction. Xinput (Mode 4): PC, Mac (requires 3rd-party software), Steam & Steam Link, VR/Oculus Rift, Nvidia Shield, Raspberry Pie, Kodi. NOTE: The layout and instructions below requires the newest firmware update here. While using Analog 1 mode (PM+Y) you can change how sensitive the movement is from normal full-tilt (default) to half-tilt sensitivity. Half-tilt sensitivity would be equal to moving the analog thumbstick on your gamepad to about halfway in any direction instead of fully (full-tilt). This is useful for games that you need more precise movement in, for example in a racing game, or to make your character move slower in your game. Some games may require the use of 2 control devices simultaneously, for example, console versions of arcade classics like Robotron™, SmashTV™, Crazy Climber™, and Karate Champ™. While the X-Arcade™ is not ideal for all types of games, for example, first-person shooters, it has the ability to play all of them thanks to DualStick Mode. DualStick Mode makes the second player joystick of a dual X-Arcade™ act like the right analog thumbstick on a gamepad. But it also makes the buttons on the player 2 side mirror those of the player 1 side, so the buttons on both sides can be used for single-player game play. As you may have gathered, this means that DualStick mode is for single-person game play, and requires a 2-player X-Arcade™ controller, it will have no effect on an X-Arcade Solo™ for example. DualStick mode is toggled on and off by pressing the PM button and button 6 (RB) simultaneously, and while in DualStick mode you can still change Joystick 1 between D-PAD and analog thumbstick mode. For testing Mode 1 (keyboard mode) and Mode 2 (Keyboard Programming mode) you can use the X-Arcade Test Program. To test your controller is working as an Xinput controller, download and run Xinput Test. For DirectInput or Xinput you can test using either A) this web-based HTML5 Gamepad Tester, or B) press the Windows key on your keyboard (or click on the Start button) and search for "joystick" and open "Set up USB game controllers" (or similar depending on Windows version), then click Properties to test. When the light is on you are in play mode, when the light is off you are in program mode. MODE 1 (switch closest to the serial cable, or yellow wire on the switch itself), 3, and 4 cannot be programmed. The mouse buttons on the Tankstick/trackball cannot be programmed. For most emulators (including MAME™) you will want to use Mode1, and change any settings in the game or emulator accordingly. This saves; the programmable memory for games or emulators that do not have; an option to change the controls, and it is easier to remember. On newer Tri-Mode PCBs and X-Arcade controllers with the Tri-Mode PCB only, mode 2 is programmable to any keyboard key. You can check if you have a Tri-Mode PCB by switching to mode 4 which will make the X-Arcade act as a gamepad instead of a keyboard.